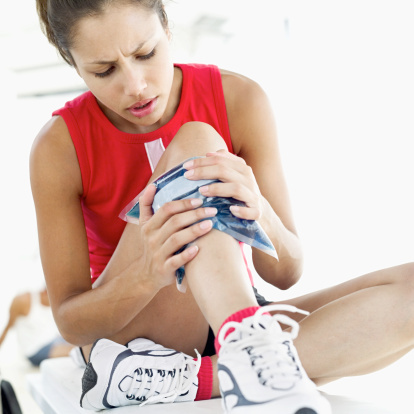 Do you have Knee Pain or Injury? Few people know that knee pain is sometimes a sign of Spinal & Pelvic Imbalances. Our doctors have recently seen quite a few patients coming into our clinic with knee problems. Low back or pelvic imbalance can usually begin to give more trouble elsewhere like in the knees. Some people may start to get knee problems when they challenge their body with more physical activity like running. A full spinal and biomechanical check up from our chiropractors, with appropriate treatment can avoid most of the problems we see in the clinic and more commonly in runners. One regular problem we have been seeing patients suffering from is Chondromalacia Patella. Also known as runner’s knee, it is a degenerative condition of the cartilage surface of the back of the knee-cap, or patella. It produces discomfort or dull pain around or behind the patella. The condition may result from acute injury to the patella or from chronic friction between the patella and the groove in the femur through which it passes during motion of the knee. It can be caused by a single traumatic incident or by chronic trauma, like applying excessive force to the knee cap via exercise, such as running. If you start getting knee pain call us, we provide our patients with a full spinal check-up, footscans, chiropractic treatment and physiotherapy to get your body fighting fit again. This entry was posted on May 6, 2013 at 3:38 pm and is filed under Uncategorized. You can subscribe via RSS 2.0 feed to this post's comments. You can comment below, or link to this permanent URL from your own site.